June 2010 – I gaze at the spartan brown door of apartment number 264, not quite knowing what to expect behind it. 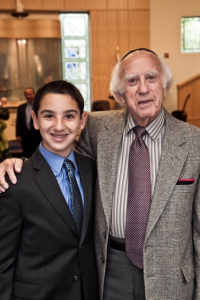 I am a year away from my Bar Mitzvah – the day that I become a man within my Jewish community. And though this important rite of passage still seems somewhat far off to my twelve-year-old self, it is the reason that I am standing in the hallway of Heritage Pointe, a Jewish retirement home in Southern California. While highlights of Bar Mitzvahs generally include reading from the Torah or celebrating with friends and family, an important aspect of this ascent into manhood is the Mitzvah Project. This project, which can range from volunteering at a soup kitchen to collecting used sports equipment for underprivileged children, is completed in the months leading up to the Bar Mitzvah and serves as a young man or woman’s way of giving back to the community. Intellectually curious by nature, I knew that I wanted my Mitzvah Project to somehow incorporate my particular passion for history. I stumbled upon Heritage Pointe one day while brainstorming ideas, and I instantly decided that I would undertake my project there. Heritage Pointe’s appeal lay in the fact that its residents had lived through the modern history that I spent nearly every moment of my free time reading about. And there was one specific event in modern history that I felt would be appropriate to center my project on – the Holocaust, the ultimate story of my people’s suffering and survival. Standing on the threshold of adulthood, I was ready to learn the lessons of a catastrophe which must never be repeated from someone who had endured it. A little unsure of what volunteering there even entailed, I called Heritage Pointe. I found out that young volunteers could be paired with a resident to “brighten his or her day” with weekly meetings. This form of volunteering was certainly the best way to do good while catering to my appetite for learning, I thought. I signed up immediately, but with one request: could I possibly be paired with a Holocaust survivor? “Yes, come in,” an accented voice replies. I open the door, take a few steps into the modest living room, and stop in my tracks. My eyes dart around the room, catching glimpses of collections, gadgets, and paraphernalia that this man has amassed throughout almost ninety years of life. A sizable stack of books dominates a humble side table that sags under the weight of thousands of pages of knowledge. A small screwdriver, a miniature pair of pliers, and other diminutive hand tools lie scattered around a half-complete model ship. A print of Lincoln in Dalivision hangs on the wall alongside black-and-white photographs of Yad Vashem and a Schindler’s List movie poster. We are separated by nearly two feet and nearly eighty years. I feel out of place, an intrusion into the foreign world of his apartment. On that day, I don’t think either of us could have imagined that, over the course of four years, we would grow to regard one another as family. With time, his patchwork decor and his distinct wardrobe would become, just like his relaxed chuckle and clever quips, a comforting characteristic of a person I love. Our conversation twists and turns; one minute we are talking about the latest sports news, the next about an interesting discussion from my English class, and the next about an apparatus Ziggy has invented to pick fruit off tall trees in the Heritage Pointe courtyard. At times, it’s easy to forget that this close friend I’m sharing a joke with is the same man who hitchhiked through the Siberian tundra after bribing his way out of a prison where he was held as an Enemy of the State. It’s easy to forget that the man who has spent so many hours cheering me on at my soccer games and sitting beside me at family dinners has also spent so many days of his life hiding under the floorboards of a Righteous Gentile family’s farmhouse. It’s easy to forget that the man applauding in the audience of my eighth-grade musical production also snuck across the Eastern Front of World War II in an attempt to return home, or that the man who wept with me as Jean Valjean ascended to heaven in the stage production of Les Miserables also shed tears as an Einsatzgruppen killing squad shot wildly at him and hundreds of other Jewish captives. And indeed there were tears in my eyes at my Bar Mitzvah, when I knew that the man who handed me my symbolic prayer shawl had, seventy years ago, used his traditional Jewish prayer straps to tie himself into the uppermost branches of a tree while he hid from the Gestapo in the Carpathian foothills. Yet there is one more aspect of Ziggy’s story that is easy to forget. Every once in a while, Ziggy’s voice wavers in the middle of a thought-provoking discussion or an intelligent remark. And then, the wisest man I know wipes his eyes and says, “Justin, they took my education.” In these moments, I am jolted by the reminder that the Holocaust stole Ziggy’s opportunity to fuel his intellect with formative schooling. I look down at the carpet, unsure and uncomfortable. The man weeping beside me about being uneducated is capable of drawing parallels between the teachings of Talmudic rabbis and ancient Roman scholars. The sheer happiness I see in Ziggy when we are discussing a cerebral issue paints a vivid picture in my mind of a young Ziggy in a life he did not get to live. Ziggy deserved to pursue a college education – his signature radiant grin undoubtedly plastered on his face as he debated a professor’s point in a crowded lecture hall or constructed a clever argument for his dissertation. But instead, he was forced to spend his young adulthood wondering what horrors the next day of the Holocaust had in store for him. Ziggy’s loss of education has always been the detail of his story that I wrestle with the most, the one that hits me even harder than his harrowing accounts of prison cells or firing squads. Nevertheless, for a long time, I wasn’t really able to explain why it weighed so heavily on me. Throughout this reflective process, though, I have peeled back the many layers of our relationship and have begun to understand my emotional connection to his deprivation of formal learning. I now realize that, the very first time I knocked on the door of apartment number 264, I had already been prepared by history books to hear stories of concentration camps and mass extermination. But to me, these horrors were just grainy gray-scale photographs on a glossy textbook page. No number of books could have prepared me for tragedies that registered on a deeply personal level. And Ziggy’s loss of formal schooling hit me about as personally as possible. Ziggy and I are equally voracious learners, and I now realize that – although our shared background as Jews is what brought us together four years ago – our shared passion for learning is what has drawn us close to one another. Really, the differentiating factor between my education and Ziggy’s is that he was chased away by the Gestapo before he had the chance to delve deeper into his studies while I have been fortunate enough to pursue an immersive academic environment at a rigorous boarding school. It has taken these last few months of reflection for me to realize that Ziggy’s deprivation of education haunts me because he so greatly deserved what I am so lucky to have. But while Ziggy’s loss of learning is so upsetting, his love of learning has created a classroom in apartment number 264. It is a most unorthodox classroom, one without grades or assignments. In fact, there is not even a designated instructor or student, with Ziggy and I opting rather to engage in an amorphous dance of reciprocal teaching and learning. But it is a classroom where I literally and figuratively face my history, and where I reflect back an image of what Ziggy’s mind would have looked like in another country and era. There is no age gap anymore. We are peers separated only by our circumstances. I am from Southern California and just completed my second year of boarding school at Phillips Academy Andover in Massachusetts. I am the captain of the varsity wrestling team, play soccer, participate in the chess club, and work as a tour guide. I also write for TheBootleg.com, Stanford University’s football fan website, am a charter content creator at YourSports.com, and have published two books, Straight-A Study Skills (2013) and recently-released The Boarding School Survival Guide (June, 2014). You can email me at boardingschoolsurvival@gmail.com, visit my website at justinmuchnick.com, or follow me at @BoardingSchl on Twitter and at The Boarding School Survival Guide on Facebook. 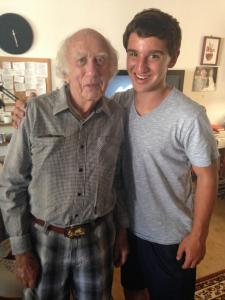 Facing History and Ourselves recognizes the impact of students getting to know individual Holocaust survivors and their stories. Click here for a digital collection of Survivor Profiles. Facing History and Ourselves is pleased to partner with guest bloggers.